According to a recent report by Transparency Market Research (TMR), the global market for vertical cavity surface emitting laser (VCSEL) is moderately distributed with five companies collectively owing 47% of the market in 2015 while rest of the pie is fragmented among a large number of smaller players. 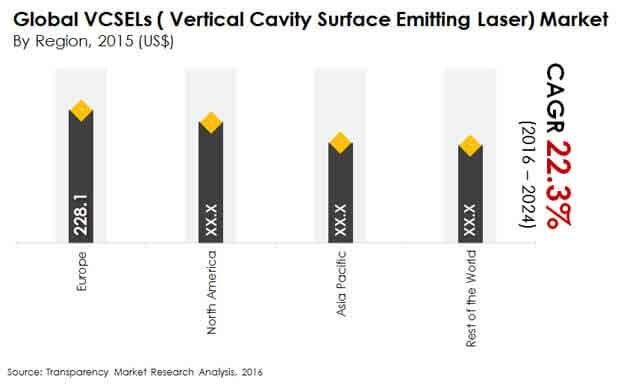 The TMR report rates Broadcom Ltd, Finisar Corp., Lumentum Holdings, Inc., II-VI Laser Enterprise GmbH, and Sumitomo Electric Industries Ltd. are the most prominent companies currently operating in the global vertical cavity surface emitting laser market. As per the TMR estimations, the opportunities available in the global market for vertical cavity surface emitting laser were worth US$775.2 mn in 2015, which will reach a valuation of US$4.7 bn by the end of 2024, expanding at an incredible CAGR of 22.3% during the forecast period of 2016 to 2024. The report suggests that the global VCSEL market has evolved in the recent past as a result of several mergers and acquisition, while product innovation via consistent research and development continues to be the primary strategy for the players to gain ground over the competition on their own. For example, Finisar Corp. consistently introduces new products, such as 64 Gbaud High Bandwidth Integrated Coherent Receiver, which was introduced in 2016. On the basis of raw materials, the report segments the global vertical cavity surface emitting laser market into gallium nitride (GaN), indium phosphide (InP), gallium arsenide (GaAs), and others such as InGaAsN and AiGaAs. Among these, gallium arsenide accounted for 77.02% of the market in 2015 and is expected to remain most profitable raw material segment throughout the forecast period, expanding at an impressive CAGR of 41.1% from 2016 to 2024. This substantial demand is a reflection of growing usage of infrared LEDs, laser diodes, microwave frequency ICs, monolithic microwave ICs, optical windows, and solar cells in various industries. Application-wise, the report rates the segment of optical fiber data transmission as most profitable. Region-wise, the report evaluates the potential of North America, Europe, Asia Pacific, and the rest of the world, and rates Europe as the most lucrative region, which accounted for 30.0% of the demand in the global vertical cavity surface emitting laser market in 2015, although Asia Pacific is projected to expand the demand at the most rapid rate during the forecast period. Massive investments made by the government in the U.S. for the development of new VCSEL defense prototypes, research undertaken by universities in the country for the development of more stable and efficient laser diodes, and the presence of many global semiconductor companies in the country is propelling the demand in the North America vertical cavity surface emitting lasers market. Vertical cavity surface emitting laser exhibit several advantages over its traditional counterparts and hence the adoptability is increasing. The advantages of VCSELs include robust reliability, higher compatibility with other circuitry and detectors, package ability, power efficiency, and scalability. In addition to that, the preference of VCSELs by the manufacturers is because it allows testing at a number of stages throughout the production process. Consistent check for material quality and processing issues helps the manufacturers to reduce production cost, and thereby the demand in the global vertical cavity surface emitting laser is increasing. According to the author of the report, "VCSELs market will gain from its expanding usages in several new applications such as GPS, atomic clocks, proximity sensing, and magnetometers."